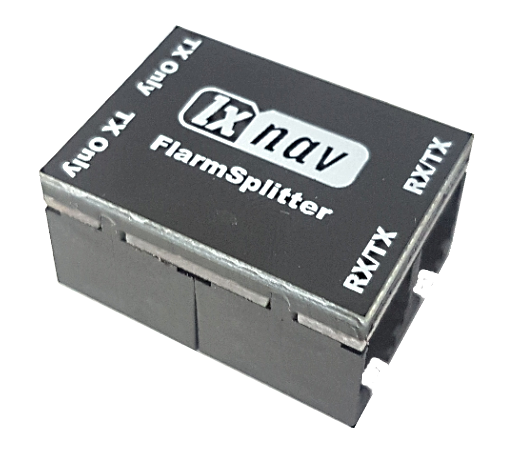 Flarm splitter to be used in an installation where a Flarm is providing a GPS input to a standalone vario (such as the S8, S80, S10 and S100) and there is also a separate flarm display in the panel. 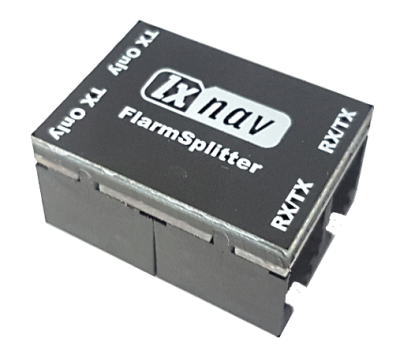 Without this special splitter, when attempting to declare a task from the vario to the Flarm, you will get a declaration error. This is due to the vario sending the declaration on the RX line in the RJ12 cable, which the flarm display will pick up. This causes the declaration error as the declaration is supposed to go only to the Flarm unit, not the display. This splitter, with its two types of output (RX/TX and TX only) allows transmission between the vario and flarm unit, without transmitting to the flarm display (which should be connected to the TX only output.